Next time you dine at one of Barry Terrell’s legendary restaurants, you will experience excellence at its best. T-Bone Tom’s, Tookie’s Hamburgers and the newly acclaimed Tookie’s Seafood are good examples of a well run food and beverage establishment. The experts say an organization’s success begins at its head, and the Terrell dynasty certainly does, beginning with owner Barry Terrell, who has close to 40 years in the service food industry. Terrell from Nederland, Texas, hails from a hardworking blue collar background. From his father, who worked and retired from strenuous plant work, he learned a strong and honest work ethic. Terrell waited tables in his youth and while attending Lamar University in Beaumont. That is where his restaurant journey began — learning the business from the back to the front of the house. He then did an eight-year stint with Gallagher’s Steakhouse and another nine years with Landry’s Restaurant Group, where he learned the corporate side of the business. Terrell had reached the height in his corporate career as the Kemah Boardwalk’s first general manager. In that job, he was responsible for acquiring other Kemah restaurant establishments and making the transition to Landry’s restaurants an easy one. After acquiring a great deal of restaurant knowledge, he learned what not to do and what to do right. Opportunity knocked on Terrell’s door again in 1998, and he left Landry’s and purchased T-Bone Tom’s landmark restaurant in Kemah. Using his own stock options, investments and money, he accomplished his lifetime dream — to own his own restaurant. Barry Terrell put his instincts and knowledge to work. It all started with his integrity, handwork, hands on approach and recruiting the best team possible with the money he could afford. Twenty years later he has expanded and improved the food and quality of service of T-Bone Tom’s. “We make sure our hot food is hot and our cold food is cold, as well as striving to give excellent customer service,” he said. 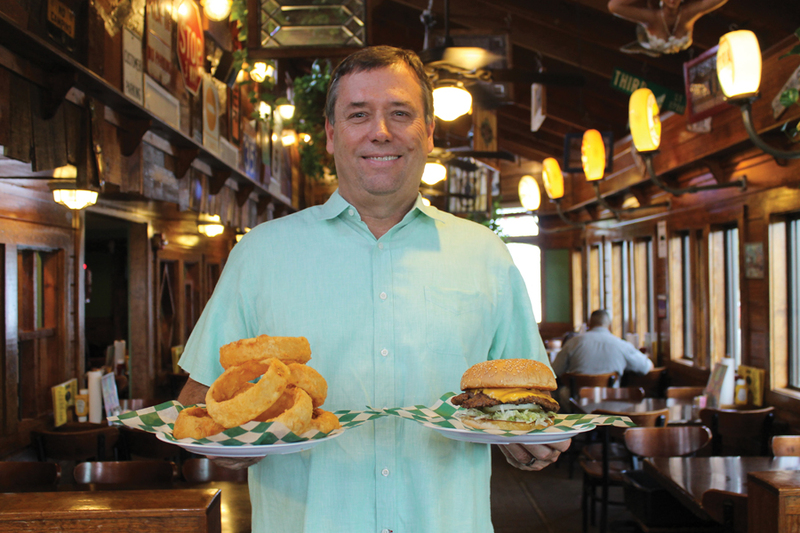 With the success of T-Bone Tom’s and his “can do” competitive spirit, he next acquired and rebuilt the popular Seabrook restaurant, Tookie’s Hamburgers – a Hurricane Ike victim which had been dormant for years and was becoming a Seabrook eyesore. Terrell and his award winning management team, which consisted of Vice President Ali Velasco, General Manager Jeff Saurwein and the rest of the troops, improved the restaurant from the ground up, improved quality, made the burgers bigger and enhanced the atmosphere and service. It was a big challenge but the result was a big success. It satisfied customers, put Seabrook back on the map and increased the city’s revenues not only from the sale taxes, but monies spent by the restaurant buying local and employing good local talent. The next major accomplishment was building and operating the new Tookie’s Seafood concept in Seabrook — another success for the Terrell’s team and one that brings thousands of visitors and dollars to Seabrook. Tookie’s Seafood employs local talent and buys quality seafood locally from Rose’s Seafood in Seabrook. The new news from this dynamic restaurant group is they will be moving Tookie’s Hamburgers, a Highway 146 victim, from Seabrook to Kemah. Seabrook’s loss is Kemah’s big gain. According to Barry Terrell, “We wanted to stay in Seabrook but could not find the proper real estate location to operate our business. Tookie’s Hamburgers will relocate at the site of the former Ichibon’s Restaurant in Kemah. It will be larger with a bigger bar area and outdoor patio featuring live music. It’s also rumored that Tookie’s will be serving breakfast each morning. Barry Terrell is a family man and enjoys spending time with his supportive wife, Melissa ,who handles the financial and banking matters. They have been married for 30 years and like to kayak the Guadalupe River, dining out and sharing time together. They have three children — son Reagan, who is the Tookie’s Seafood sous chef; daughter Helena, a geologist living in Florida with her husband, Navy submarine officer, Lieutenant Norris, who attended the U.S. Naval Academy; plus their adventurous son Travis , who lives and works in California. He is also an avid surfer and loves the lifestyle. Barry Terrell’s hobbies include playing senior hockey, cooking and kayaking. Recently during Hurricane Harvey the restaurant group, led by Terrell, fed hundreds of hungry storm victims. They prepared and served over 2,100 complimentary meals at Bay Harbor Methodist Church. The restaurant group sponsors many community groups like Kemah Lions Club, local churches, youth sports and many more. A special salute and thanks to the entire Terrell Team. He is a generous community civic leader, serves our Bay Area well, a successful businessman and family man who believes in his award winning team. Congratulations Barry on a job well done. Awesome man with an awesome family!